Chartering a vessel puts charterers in a position whereby they have a potential exposure to be held liable for unexpected and unforeseen incidents. The most frequent claims are damage to hull and cargo claims, however, third party liability like personal injury (or worse) and pollution are also real risks; exposures, which can run into millions of dollars. Under Time Charter contracts these risks are generally recognised, however, under Voyage Charter contracts these risks are many times still underestimated. Often there is the perception that a cargo is just booked on a ship and the vessel will bring the goods to destination. The vessel is loaded and discharged in named ports and the Master signed the Bill of Lading. So why would a charterer be exposed? In most Charter Parties the vessel is directed to 1 gsbaaaa 1 sp (…) ; 1 good safe berth always accessible always afloat 1 safe port (…). This simple abbreviation mostly used in boxes 10 and 11 in for example the Gencon 94 Charter Party makes charterers responsible for the safety of the port. A misconception is that well known ports, frequently called, are safe. Safe doesn’t mean safe at this moment in time, but safe at the moment the vessel is in port. Any port in the world can become unsafe for the particular ship on charter. Accidents can happen always and everywhere. Conveyor belts collapsing on top of a vessel; a floating crane capsizing into the side of a vessel; severe weather conditions and poor emergency protocols in a port; uncharted wrecks or debris on the seabed damaging the ship’s bottom; ships dragging anchor by abnormal currents colliding into other ships; and many more incidents which were unexpected and unforeseen but did happen. And yes, this can be a charterers problem: the owner of the vessel will hold the charterer liable for damage to hull as a result of an unsafe port. These claims can run as bad as the total loss of the vessel. Especially the first clause is more than just an exposure for stevedore damage; this can make the charterer liable for improper stowage of the cargo. Ships have capsized and sunk because of shifting of cargo and charterers were held liable for it. The costs for defending a case like this alone can run into hundreds of thousands of dollars, if not exceeding a million. Also during loading and unloading a lot can go wrong resulting in a serious damage, and albeit caused by the stevedores, the charterers will be held liable. Here too, a simple mistake can lead to a disaster. We’ve seen anything from hold ladders being “discharged” together with the cargo, to ships on fire after welding. Serious things can go wrong but fortunately the frequency of serious claims is low. However, the impact can be enormous and can have a devastating effect on your balance sheet or prevents you from trading if your credit lines are blocked. Charterers Liability insurance with Charterama offers affordable protection and an experienced crew to keep you in business. 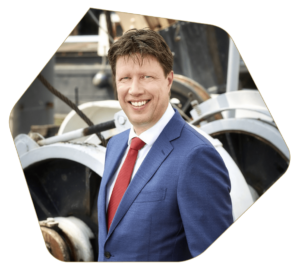 Charterama, with offices in Rotterdam and Hong Kong, is a specialist underwriter focused exclusively on Charterers Liability insurance and Defence (FDD) and related business. We offer a full range comprehensive Charterers P&I cover, able to respond worldwide with an extensive global network of correspondents. We have a dedicated team of specialists who have proven track record and a long-standing experience and reputation in Charterers Liability. Charterama is committed exclusively to the charterers’ market and offers a dedicated alternative to the P&I market. Charterama has entered into a partnership with leading marine insurer RSA, to market and distribute Charterers Liability and FDD cover on a global basis. This partnership means charterers will benefit from the unique combination of Charterama’s deep technical knowledge and RSA’s financial robustness, as demonstrated through its A rating from Standard & Poor’s. This article is written by Lucien Lesuis.